Lion Gary Colton, a 29-year member of the Fond du Lac Evening Lions Club, was presented with a Birch-Sturm Fellowship at the District 27-B1 Lions Convention in Manitowoc. It is a tradition for district Lions to donate the $1,000 to the Wisconsin Lions Foundation after a governor serves his term. 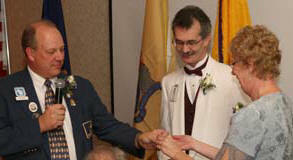 Colton was the District Governor during the 2005-2006 Lions year. Pictured are Wisconsin Lions Foundation President Eric Ender with Lions Gary and Elaine Colton.